Tilbring en dag som slapper av på en privat strandklubb på Isla Mujeres på denne dagstur fra Cancun. Du vil cruise rundtur om bord på en katamaran med en all-you-can-drink åpen bar. Fortsett festen på land med tilgang til strandstoler, hengekøyer, strandvolleyball, kajakker og snorklingutstyr. Gled deg over en deilig frokostbuffé i restauranten ved stranden og en åpen bar. Din entréavgift inkluderer skap, håndklær og en barneklubb. 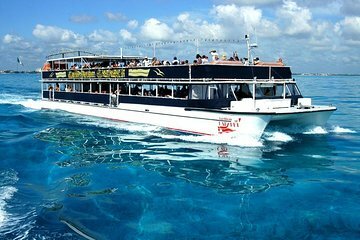 Ta deg til Playa Tortugas Pier i Cancuns hotellsone, og styr en to-dekk katamaran for Isla Mujeres. Under den korte reisen til øya serverer du forfriskende juice og brus sammen med alkoholholdige drikker som margaritas, tequila soloppganger, rumstamme, piña coladas og øl fra den åpne baren om bord. Ved å nå privat strandklubb El Pescador (The Fisherman), har du tilgang til en snackbar. Bruk hengekøyer, palapas (strandhytter) og komfortable lenestoler mens du slapper av eller spiller spill som kort og dominoer. Skuffer, håndklær og barneklubb er inkludert. For flere eventyrlystne reisende, bli med med et spill med strandvolleyball eller fotball, ta vannsklieet i sjøen, eller ta kajakk og snorkle. Hvis du ønsker, ta en sykkeltur i sørlige Isla Mujeres mens du nyter uovertruffen utsikt over Det karibiske hav (egen regning). Motorisert utstyr (ATV, golfbil, glassbunnsbåt og mer) er også tilgjengelig for leie. Rundt om dagen kan du hjelpe deg med salatbaren og en lunsjbuffé med meksikanske og internasjonale retter. Den åpne baren er i tillegg til øl og brus. Før du går tilbake til Cancun, styr båten for et cruise langs kysten, og deretter avstig på hovedgaten for sightseeing og shopping på Isla Mujeres. Fullfør dagstur med returreisen til marinaen i Cancun; danse til musikk av et live band og delta i konkurranser og spill om bord. I was really disappointed by this tour. It was very disorganized. First, we had a hard time finding the departure location . There were no signs . I had to call the company to find the boat. Second, we were not given free towels as promised. The food and drinks were good. I would not book again. This is a full day in the sun and on the water. Staff were great. Food and drinks were great. We went snorkeling and I was somewhat disappointed due to choppy waves. I am an a avid snorkeler but I wasn't ready for the big waves we encountered. Also, we did see some fish , barracuda - but there wasn't a whole lot of vegetation or a lot of activity down below. The second stop was an hour shopping or beach experience. We just walked a bit in town - very , very busy. It was a good day. Glad we did it but with some disappointments. Trip was well organized and quite relaxing. I gave it a 3 star mainly because of food. Being a vegetarian, my family had only carrots and cucumbers and some nachos literally to eat for lunch. Other than food, the trip was great. They asked us to show up at Playa Tortugas. It was a bit difficult to find the supplier of this tour once we arrived there. We went round the place couple of times and stood in the wrong queue once before we found the correct supplier. The boat tour was wonderful, crew were quite friendly and helpful and also quite entertaining. We opted to rent a golf cart to tour the island extra price, the kids enjoyed it a lot. The guide took us to the south part of the island and also to the Mayan temple. I heard that the north part of the island was more beautiful and scenic compared to the south part. I asked the guide if we would drive to the north part as well, given the island is quite small. He said that the North part isn't part of the tour, but the boat will take you to downtown of the island towards the north part. The golf cart tour was about an hr long. The boat left the island towards the downtown area around 2:00PM, mainly stopped in that area for shopping/buying souvenirs. The shops were too crowded and really tiny, so we didn't buy any souvenirs there, neither was the view from that part of the island 'the breathtaking north side of the island' I anticipated to see. This stop was mainly focused on shopping, not the view. After stopping there for an hour, the boat left the island and brought us back around 5:00PM. On the way back, the crew entertained us with some dancing and such. All in all a good tour. I definitely recommend to keep some vegetarian options around to increase the popularity of the tour also an healthy option you see or state clearly that no food is provided on the tour for vegetarians and charge accordingly. Bad place, Bad ship, Bad instalations, fake information.